Esen’s Here! Cover Reveal Party! Giveaways, Phil, and More! Hello friends! 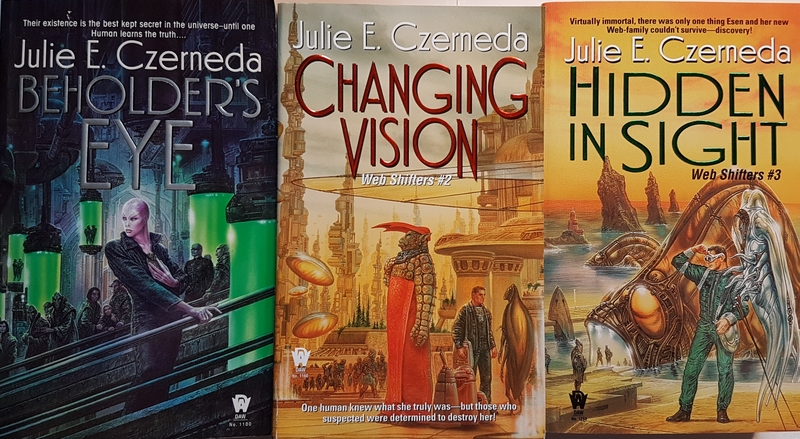 Yesterday the “Esen the Web Shifter” party began with Who and What Esen Is, the Big Idea behind her, how much fun Julie Czerneda had with writing the Web Shifter trilogy (and oh yeah, a big huge give away for the entire trilogy! ), and more! 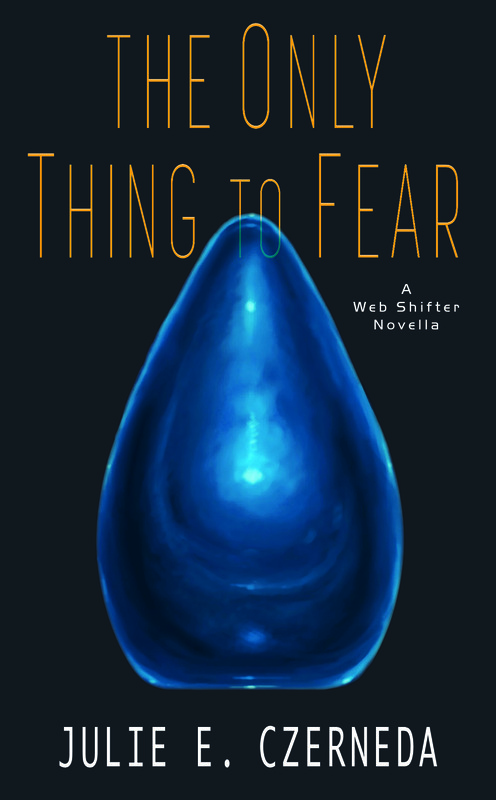 Today, I can finally talk about the gorgeous new cover art for Julie Czerneda’s newest Esen e-novella The Only Thing to Fear, and her forthcoming hardback Web Shifter novel that begins a new series, Search Image! I’m too excited to talk straight, so I’m just going to let Julie Czerneda take over and talk about the most Esen cover art ever, Phil the bust, nervous diplomats, and most exciting of all, a brand new Esen novel that starts a brand new series! oh, there’s another give away too!! Esen has been featured on every cover, but until now, not as herself. Behold Esen-alit-Quar the Web-being in all her blue blobness, courtesy the talents of Matthew Stawicki! My information for Matt was, to be honest, sparse. A blue teardrop. Not anthropomorphic. No cheerful chubby belly. No arms, face, toes, nose . . . he did it! Esen’s perfect. I love this cover. I love how she’s there, taking it all in — in this form, her senses aren’t ours. They are potent. You’ll see. In this e-novella, you meet a new character, Evan Gooseberry, diplomat-in-training. Evan’s working through his fear of almost everything, determined to make the universe a better place, but why do aliens have to have SPIDERLEGS? Poor Evan faces a crisis in his first posting and only Esen-alit-Quar can help save the day. During street theatre and glittersweat. I’m delighted to share with you the spectacular cover for Esen’s new novel, new series, and first hardcover! Toss the Glitter! 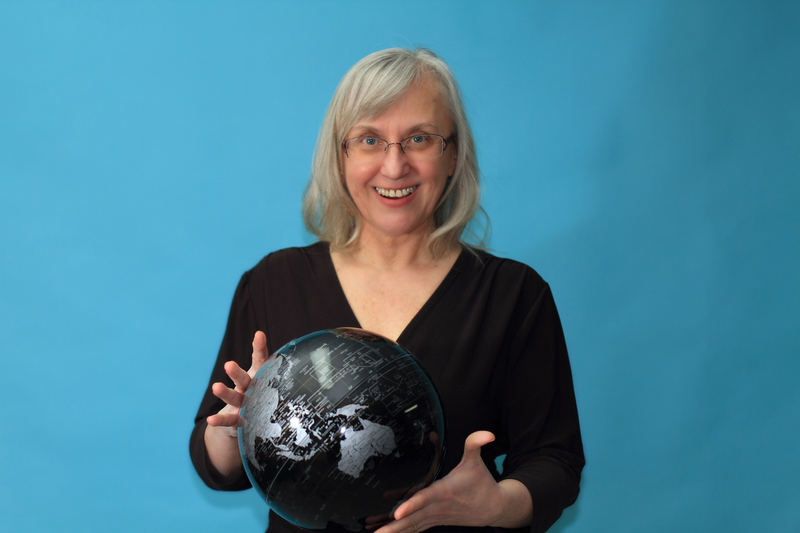 For over twenty years, Canadian author/ former biologist Julie E. Czerneda has shared her curiosity about living things through her science fiction, published by DAW Books, NY. Julie’s written fantasy too, the first installments of her Night’s Edge series (DAW) A Turn of Light and A Play of Shadow, winning consecutive Aurora Awards (Canada’s Hugo) for Best English Novel. 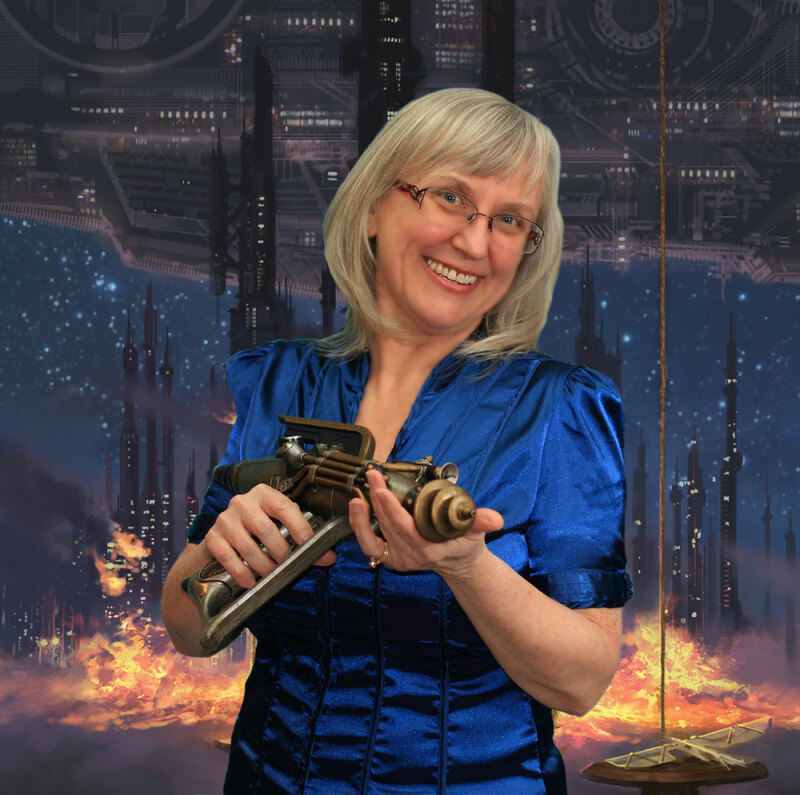 Julie’s edited/co-edited numerous award-winning anthologies of SF/F, most recently SFWA’s 2017 Nebula Award Showcase. Out this fall is an all-original anthology written by fans of her Clan Chronicles series: Tales from Plexis. Her finale to that series, To Guard Against the Dark, was released in 2017. This fall will also see the return of her most beloved character, Esen the webshifter, in Search Image. Fans of her Blobness! New-to-her Readers! It gives me the biggest of grins to mark the return and perhaps introduce to you my favourite character of all, Esen-alit-Quar. Esen for short, Es in a hurry or between friends. In honour of the occasion, we’re throwing a two day cover release party! Thanks, Andrea! Thanks DAW Books! Today, I’ll tell you a bit about Esen and why she’s so beloved. And fun. And remarkable. 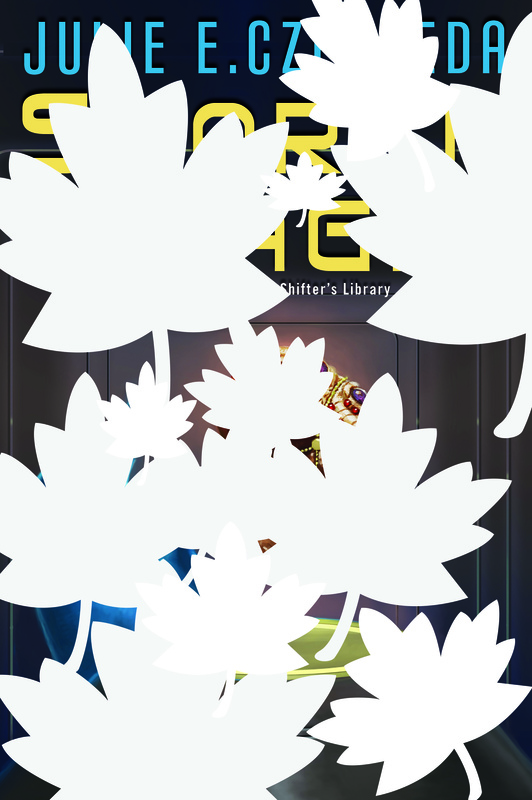 Tomorrow, you’ll see, for the very first time, not one, but TWO NEW COVERS! Really, it’s almost too much fun. Nah. There’s never too much fun. But wait, there’s more! GIVEAWAYS! Details below, but my thanks to DAW Books for not only keeping Esen’s stories in print, but in doing these gorgeous Trade Editions, released just last year! In stores all over. So Who Is Esen? Or What? Short answer? A blob of blue, shaped like a teardrop. Who happens to be a semi-immortal shapeshifter. Who has really good intentions…but is working on her life skills. 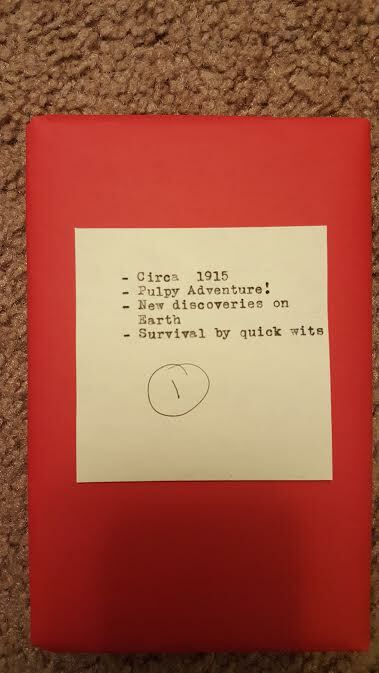 Writing Esen’s attempts to protect life in the universe–or at least keep it civil–makes me happy and always has. As it turned out, Esen made you happy too, dear readers. I’ve received more feedback and love from you for the Dear Little Blob than for all my other work combined. Coming this summer from Apex Books is MARS GIRLS, a YA adventure set on everyone’s favorite red planet. 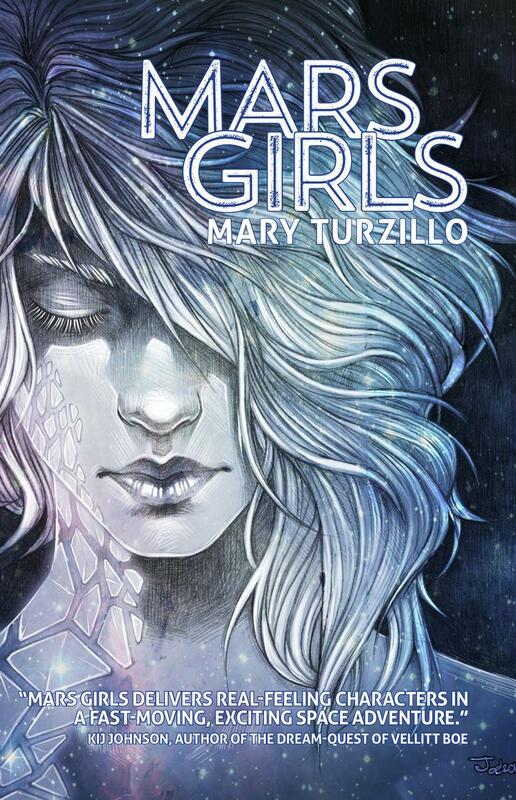 Written by award winning author Mary Turzillo, Mars Girls follows the frantic and frenetic adventures of Nanoannie and Kapera. Both girls understand the dangers of living on Mars, but still, life isn’t easy when you’re just a couple of Mars Girls! Click here to preview the first chapter of the book. And what would a blog tour be without a giveaway? Make sure you scroll all the way to the bottom of this post to get entered in the give away for a free e-book of Mars Girls. Mary Turzillo and Nanoannie and Kapera have been blog touring all over the blogosphere, head on over to these other posts to read reviews, interviews, and more! Wow, that’s quite a trip around the blogosphere! 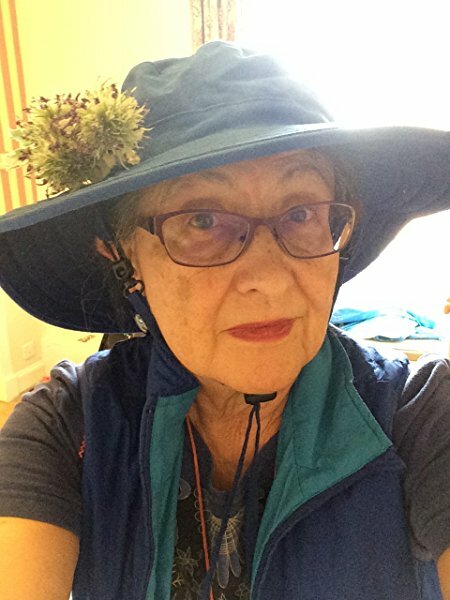 The tour ends here, at Little Red Reviewer, with an interview with Mary Turzillo. This may be the end of the blog tour, but it’s just the beginning of Nanoannie and Kapera’s adventures out in the wild. If this book looks like something you or someone you know would enjoy, head over to Apex Books or Amazon to order yourself a copy. 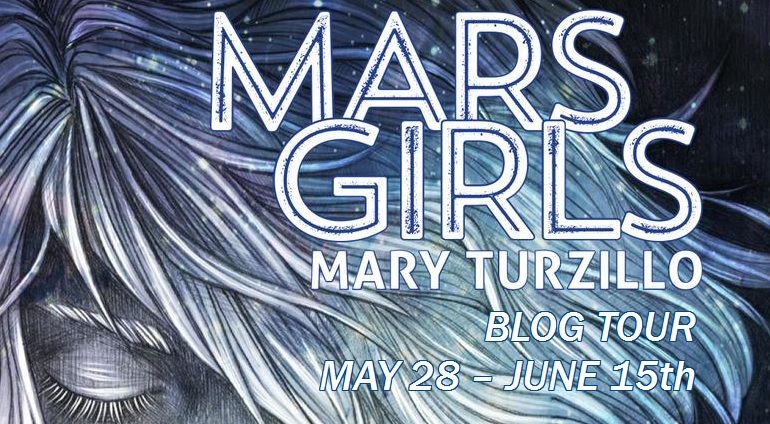 Mary Turzillo’s 1999 Nebula-winner,”Mars Is no Place for Children” and her Analog novel, AN OLD-FASHIONED MARTIAN GIRL, are read on the International Space Station. Her poetry collection, LOVERS & KILLERS, won the 2013 Elgin Award. She has been a finalist on the British Science Fiction Association, Pushcart, Stoker, Dwarf Stars and Rhysling ballots. SWEET POISON, her Dark Renaissance collaboration with Marge Simon, was a Stoker finalist and won the 2015 Elgin Award. She’s working on a novel, A MARS CAT & HIS BOY, and another collaboration with Marge Simon, SATAN’S SWEETHEARTS. Her novel MARS GIRLS is forthcoming from Apex. She lives in Ohio, with her scientist-writer husband, Geoffrey Landis, both of whom fence internationally. Andrea Johnson: Who was your favorite character to develop and write in Mars Girls? Mary Turzillo: It’s hard to choose. Nanoannie is a more complicated character than she at first seems, since her desires and enthusiasms are so conflicted. She wants adventure, but now that it’s happening, she’s rather it had more designer suit-liners and fantasy boyfriends, and fewer slightly burned hands, slimy kidnappers, and unwanted real-life lovers. She seems all surface, but despite her silliness, she has backbone. But I’m also rather fond of Cayce. He’s such a player. In fact, I like him so much that I gave him a cousin by the same name in an upcoming novel, except the cousin is younger and a rather nice guy. AJ: Without giving any spoilers, can you tell us which scene was the most fun to write? Which scene was the most difficult to write? MT: It’s hard to talk about scenes very farther into the novel with out giving out spoilers, but here goes. Out of context I’m not giving too much away. I enjoyed writing everything in the novel. If I didn’t enjoy a particular scene, it meant I’d just have to ditch it, because if I didn’t like it, how could I expect the reader to enjoy it? But my favorite was, curiously, Kapera doing her EVA. I researched space-walks thoroughly, and I even have a mug from Kennedy Space Center of the cooling radiators on the International Space Station. I wanted to show her courage and ingenuity and the fact that she persisted. The hardest passage to write was Marcus’s account of what really happened at Smythe Pharm, because the plot had gotten pretty complicated by that time. I also had to get inside Marcus’s mind. I’m writing about him in another novel, a prequel to this one, and he’s an interesting, tortured soul with a strange background. He’s been a criminal and also a devoted family man. This is all background, but it had to be subtext. It’s time for another Blind Date with a Book give away! but this time, they are all Vintage science fiction books! put in the comments what number book(s) you’re interested in. put #1, #2, etc. You can enter for more than one. due to the costs of international shipping, unfortunately this is a US only give away. I love you everyone else, I just can’t afford to mail things to you! Ermagerd I’m such a nerd, I typed up the descriptions on my circa 1940 typewriter. Gate To Futures Past Blog Tour: Julie Czerneda Appreciation Party! So, we’ve got a big party going on today! I’m part of the blog tour for the release of Julie Czerneda’s The Gate to Futures Past (book #2 in the Reunification series! Part of the huge finale for the Clan Chronicles! ), I’ve got some epic guest posts below, and there’s an even more epic US / Canada give away from DAW books! If you’re just joining us, check out my review of The Gulf of Time and Stars (eek! spoilers! 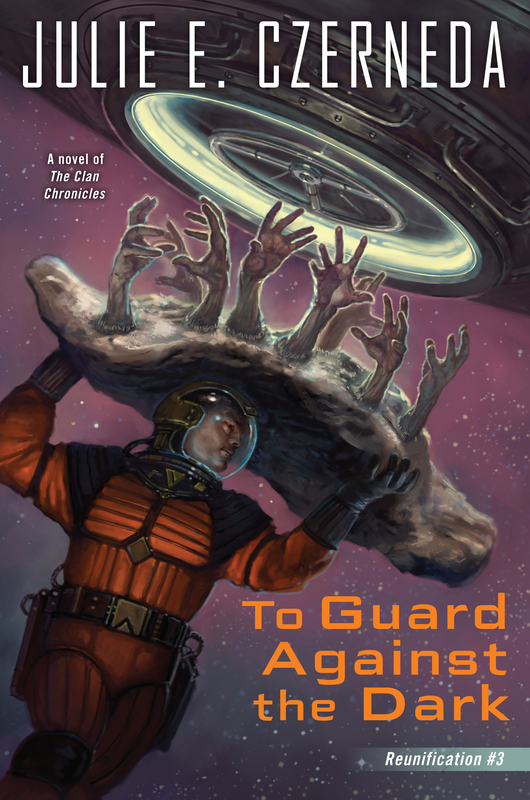 ), and Julie’s chat with cover artist Matt Stawicki about the beautiful cover art. I’ve talked plenty about how much I enjoy Julie’s work. So to celebrate this newest Clan Chronicles book, I got a bunch of friends together, and asked them to talk about how much they enjoy Julie’s work. Why do a blog tour post when you can have a big Julie Czerneda Appreciation Party instead, right? RIGHT. So let’s party! 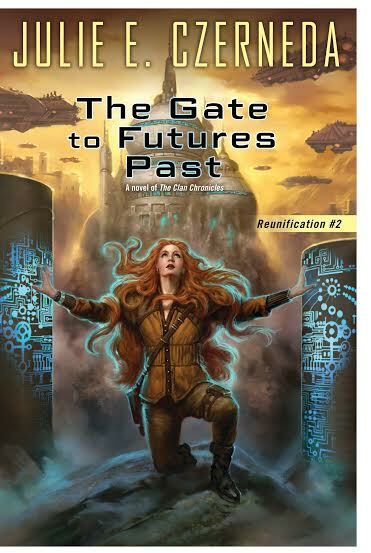 The next book in Julie Czerneda’s Reunification trilogy, The Gate to Future’s Past, is coming out in September, and I’m super excited to reveal the cover art and talk more about the series all day today. What’s the gist of the Clan Chronicles, and the newest trilogy in this career spanning series? I’m glad you asked! The Clan Chronicles is set in a far future with interstellar travel where the Trade Pact encourages peaceful commerce among a multitude of alien and Human worlds. The alien Clan, humanoid in appearance, have been living in secrecy and wealth on Human worlds, relying on their innate ability to move through the M’hir and bypass normal space. The Clan bred to increase that power, only to learn its terrible price: females who can’t help but kill prospective mates. Sira di Sarc is the first female of her kind facing that reality. With the help of a Human starship captain, Jason Morgan, himself a talented telepath, Sira must find a morally acceptable solution before it’s too late. But with the Clan exposed, her time is running out. The Stratification trilogy follows Sira’s ancestor, Aryl Sarc, and shows how their power first came to be as well as how the Clan came to live in the Trade Pact. The Trade Pact trilogy is the story of Sira and Morgan, and the trouble facing the Clan. Reunification will conclude the series and answer, at last, #WhoAreTheClan. With stunning cover art by Matt Stawicki, the artwork brings together an epic story told over the course of nearly twenty years. Julie chatted with Matt Stawicki about incorporating earlier artwork, capturing Sira’s emotions, and more. Let’s see what they said! Ta da! Here it is. The wonderful work of Matthew Stawicki, revealed at last. I’ve been waiting to share this cover with you for the better part of a year, for it was complete well before the book. Pardon? you say. How can that be? Remember the bricks? This image was one of them, firmly in my mind since I started writing This Gulf of Time and Stars. Book #2, Sira, meeting her destiny. Triumphant! That’s the magic of an image like this. Knowledge morphs impact, grants new meaning and alters perspective. What you think you see now, before reading The Gate to Futures Past, will change once you have.